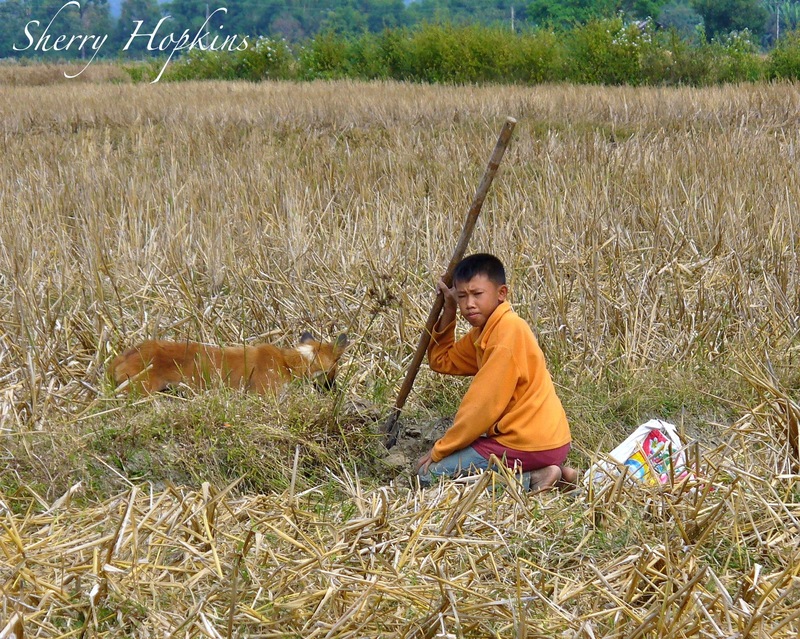 During my 18 day visit to SE Asia in 2009, I found the people there to be very industrious! 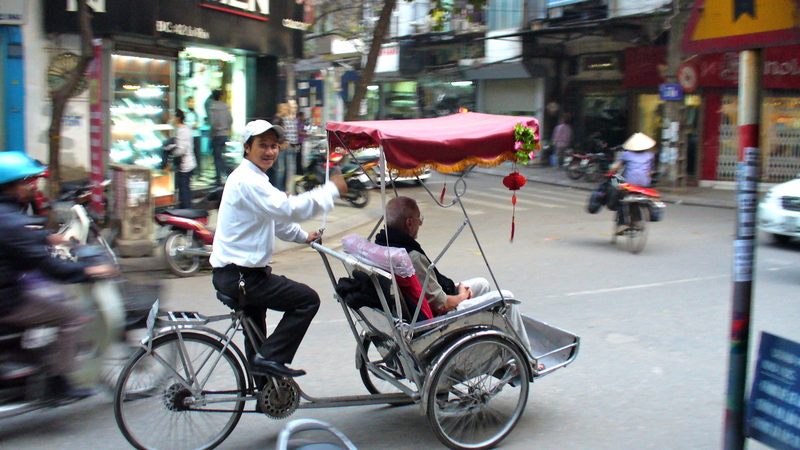 When I took this photo in Hanoi, Vietnam, I didn’t know the bicycle driver was looking at me with a friendly smile. There was so much energy and movement…always something to look at! 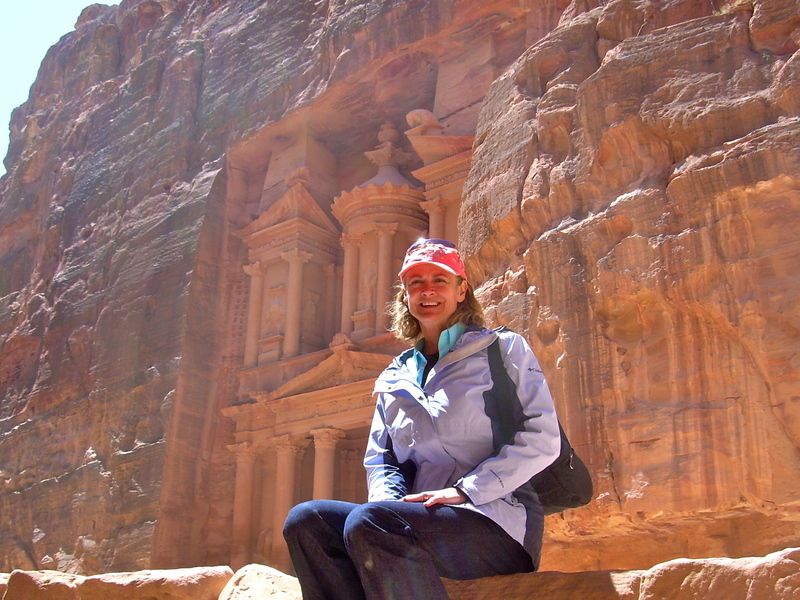 Hiking Petra is an electrifying experience! Although the landscape seems stark…it’s alive with energy! Over the course of two days, I was able to hike for miles through the ancient grounds, high into the rock formations. These horse and buggies are available for those that aren’t able or don’t want to walk. 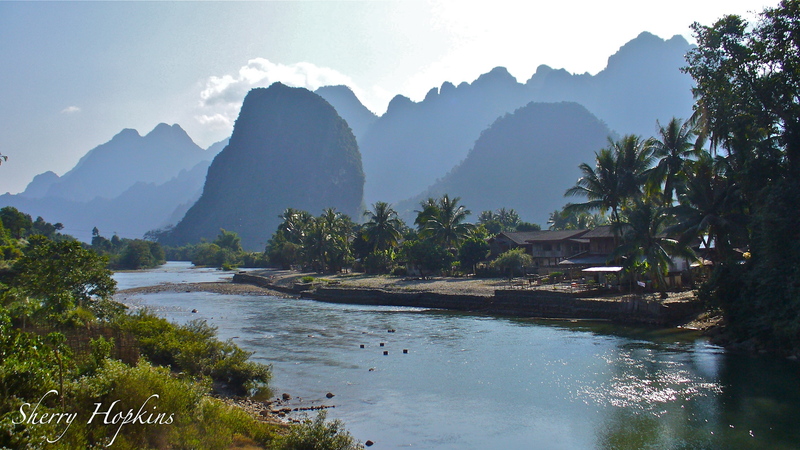 After traveling seven hours from Luang Prabang…we reached the town of Vang Vieng in Laos. As you can see, the landscape was absolutely breathtaking! 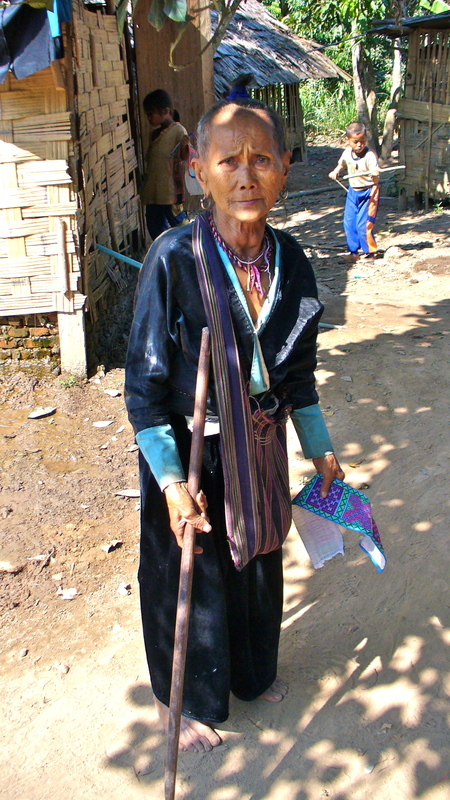 One of the women that was traveling with the G Adventures tour that I was on through Thailand, Laos and Vietnam, remarked that there wouldn’t be any night life here. There was one road leading into town and it was quite rural. With this to gaze at…I didn’t care! 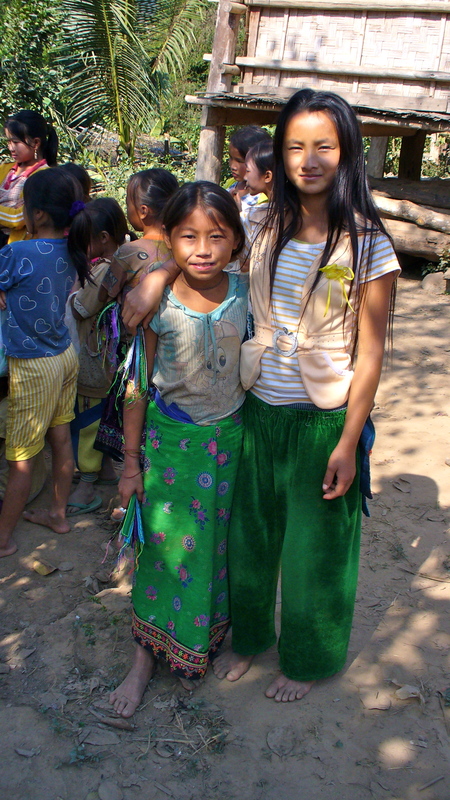 One of these sweet little girls stuck her tongue out at me after I took the photo…because I didn’t give her any money. Claire and Isabel–two of the ladies on the tour and I rented some rickety bicycles and explored some caves in the countryside. Traversing the bumpy dirt roads made us giggle…the simple things can be so much fun! Then, when Claire got up on the haystack for a photo…it started collapsing…so we collapsed with laughter! Unfortunately, I don’t have a photo of that. This photo intrigues me. I wonder what the boy was doing. His dog almost looks like a fox to me and he has a bag by his side. I would have stuck around to find out, but we were on our bicycles, so off we went. 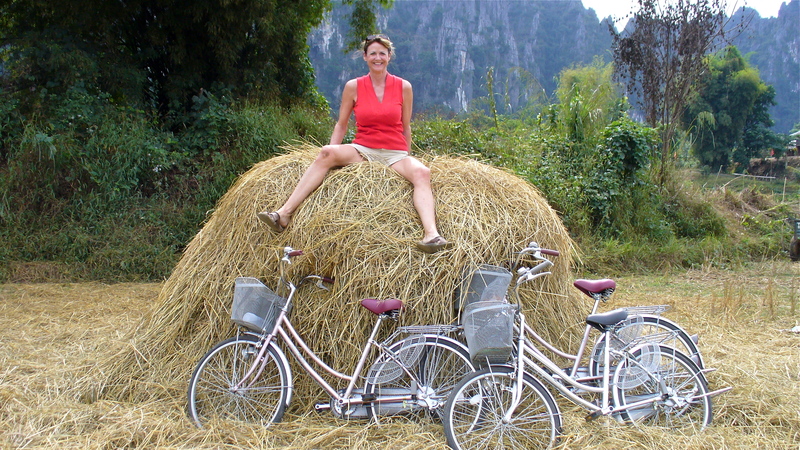 We spent two nights in Vang Vieng and then drove three hours to Vientiane, the capital of Laos. 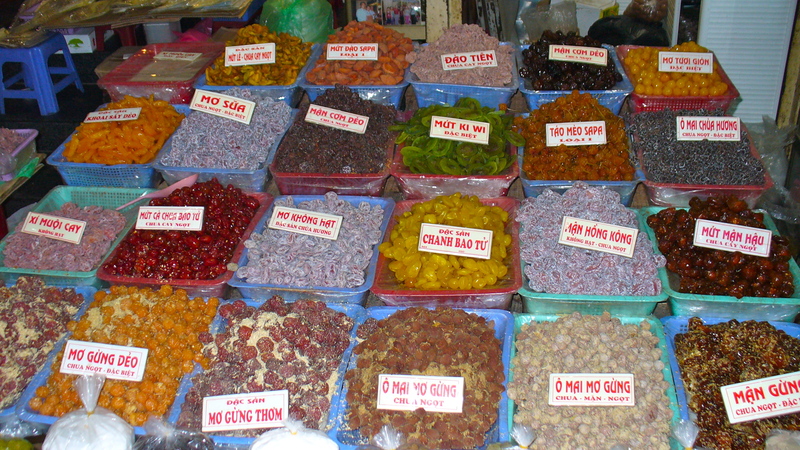 After checking into the hotel, I walked to the market and shopped. Everything was so inexpensive – $3.00 for a purse, $5 for a silk scarf, etc. 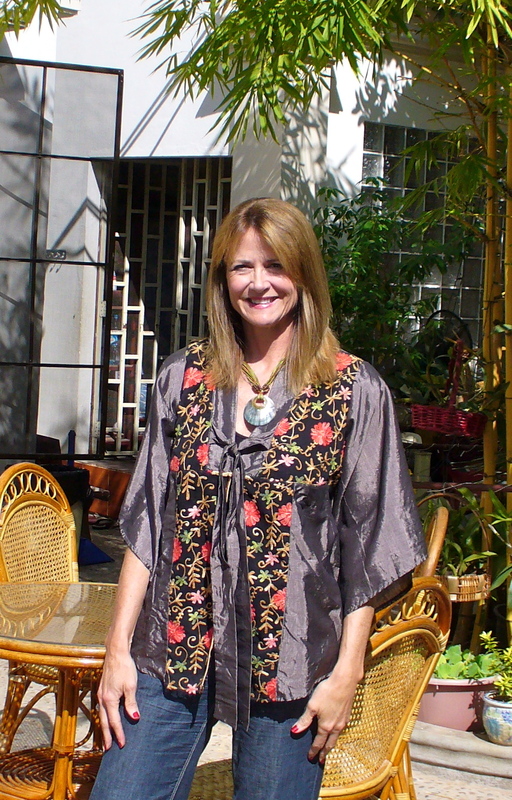 I couldn’t resist this hand embroidered blouse and splurged on a shampoo and style for $5.00! 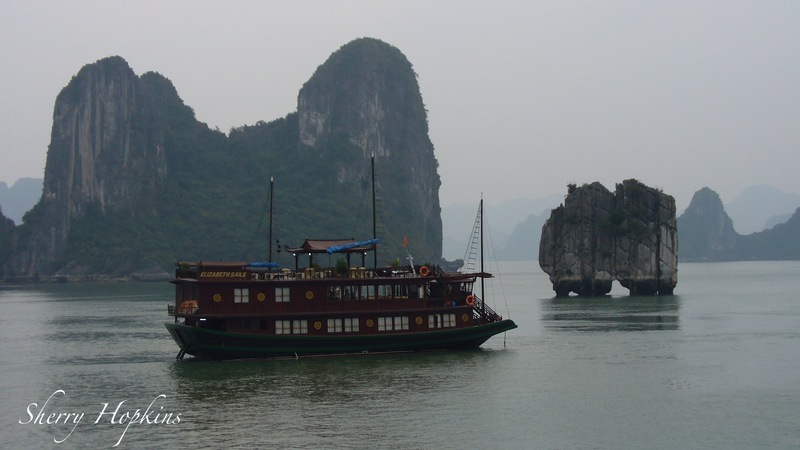 Our tour finishes with Hanoi, Vietnam and the stunning Halong Bay tomorrow! 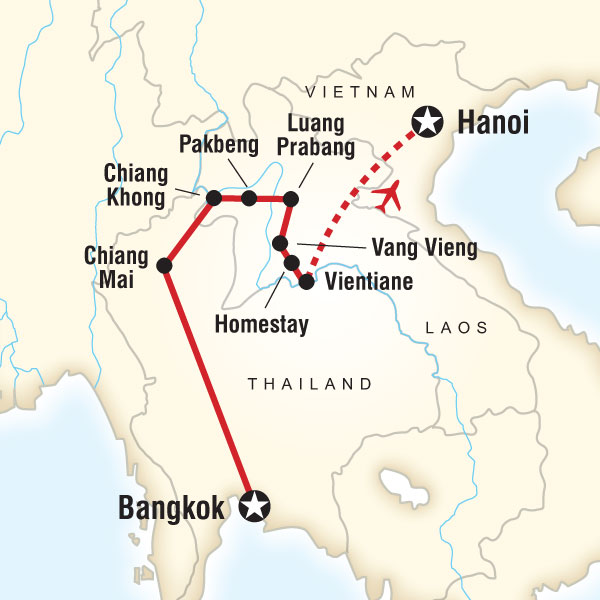 If you’re just beginning to read…this was a trip I took through GAP Adventures in 2009 with six people from Canada, US, Germany, and the UK, to Thailand, Laos, and Vietnam. We spent the night in Pakbeng, on our way to Luang Prabang in Laos, en route from Chiang Mai via Chiang Rai and Chiang Khong. I just had to say that! 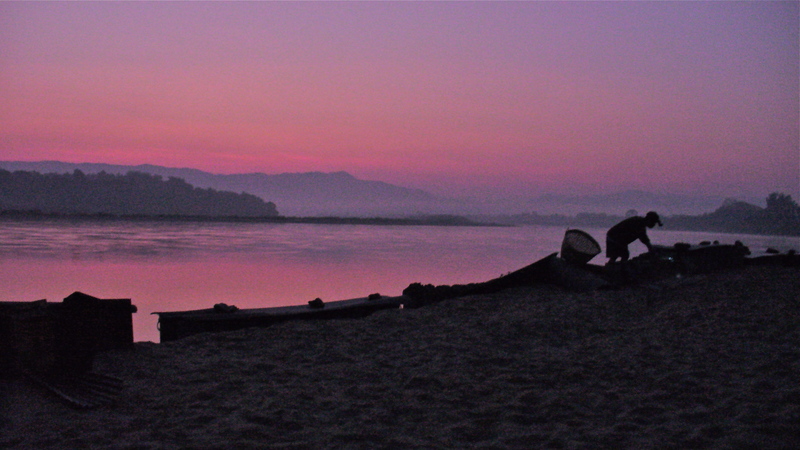 I was capturing images of the sunrise at the river’s edge and was pleased to see this fisherman beginning his day. 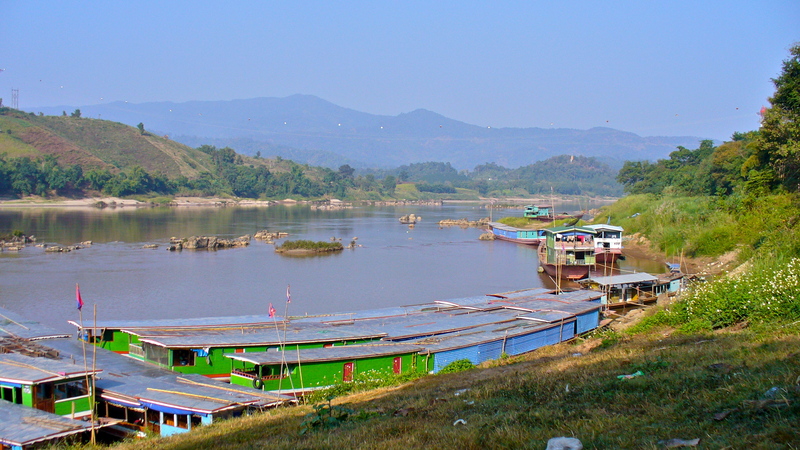 We went as a group that morning to buy 70 notebooks and pens, 8 dozen eggs, and a variety of other things from the local market to give to another group of villagers (I believe more Hmong) that live on the Mekong River. 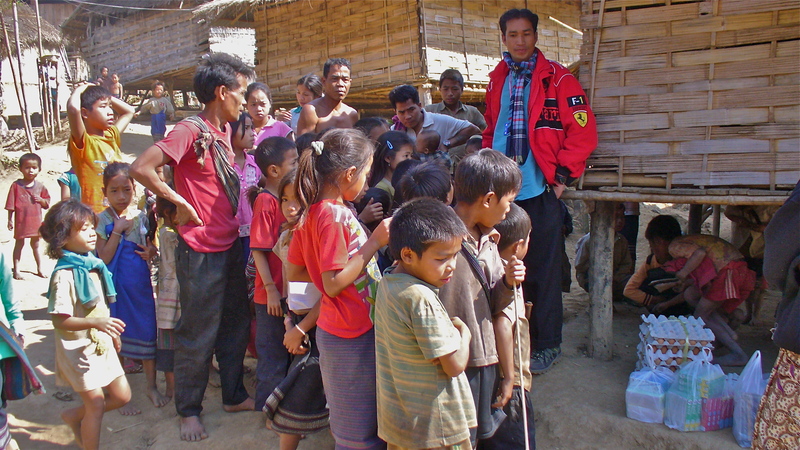 Notice the supplies lying on the ground next to the guy in the red coat, who was our Tour Guide while we were traveling through Laos. We delivered the school supplies to the children! 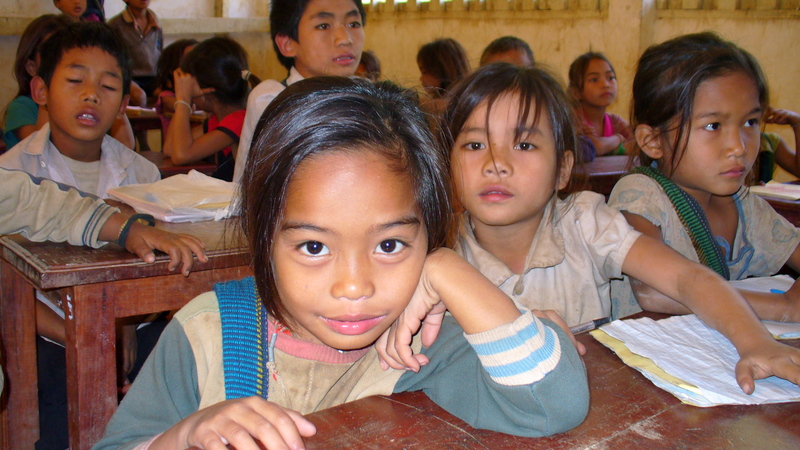 I could just put that little girl in my suitcase and bring her home…she’s soooo cute! 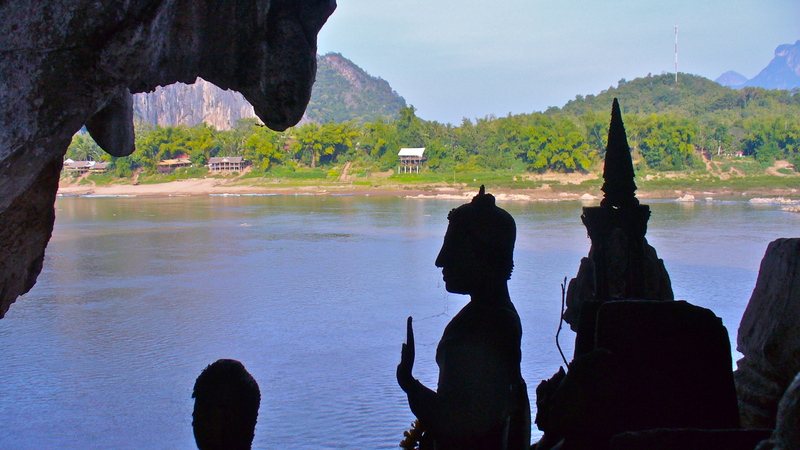 On our way to the quaint town of Luang Prabang, we stopped at a spiritual cave called “Pak Ou Caves“. 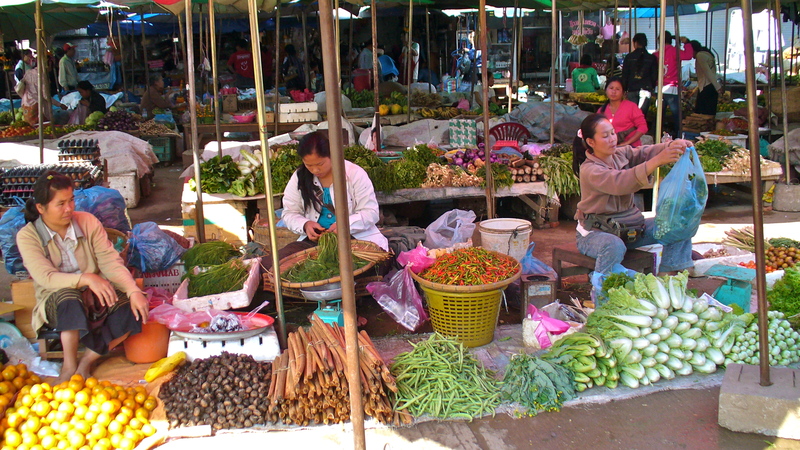 Luang Prabang was everyone’s favorite town…with lots of shopping, good food, nice markets and friendly people. 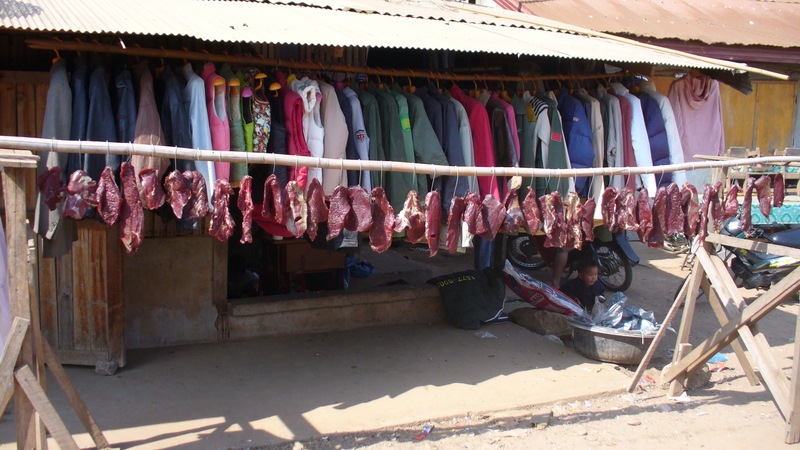 This seemed very odd…a line of clothes and hunks of meat. 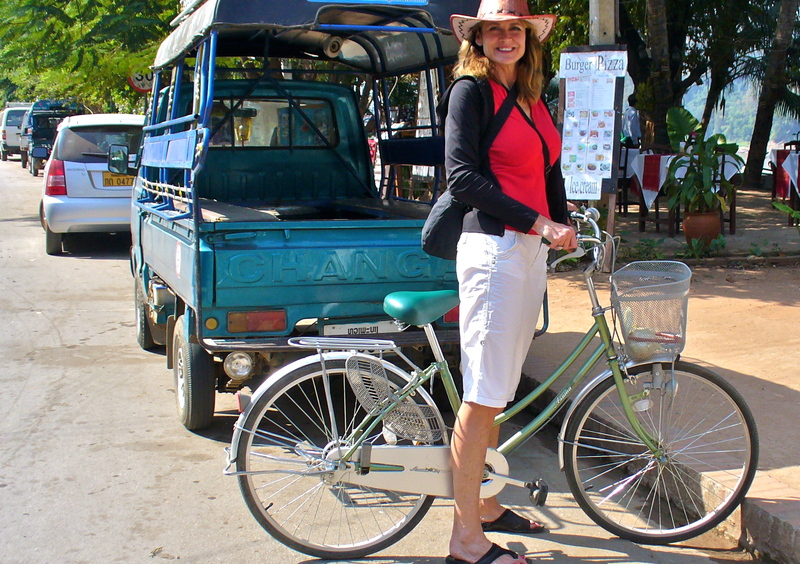 One of the women on the trip and I rented a bicycle and explored the town. It’s a great way to see more! I also had another massage by a young girl that had very strong hands. If you’ve been reading along…you know that in 2009 I did a lot of travel. 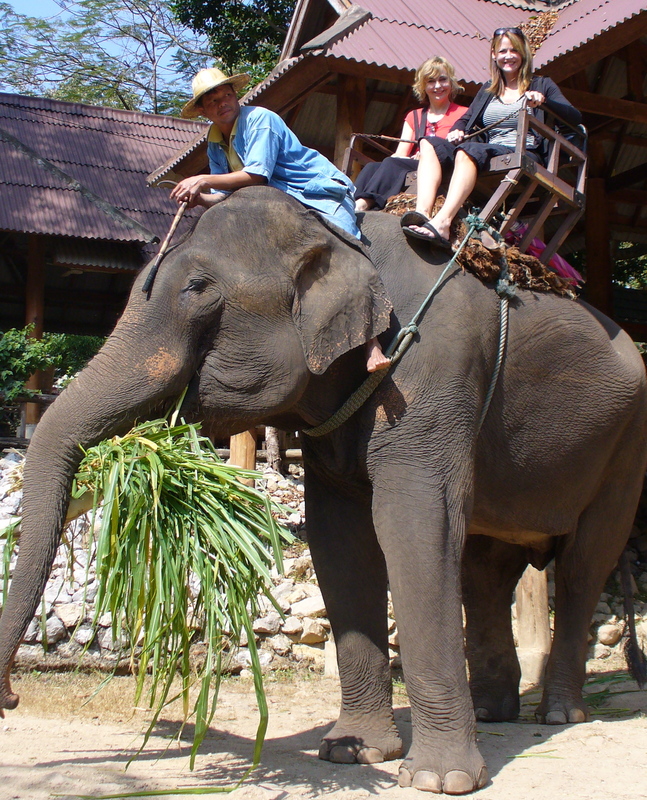 It began with Egypt and Jordan in March–followed by Peru for three weeks in May, and now in December, another G Adventures trip to Thailand, Laos and Vietnam. After checking into my hotel in Bangkok, Thailand…having just traveled 33 hours from the Midwest, I needed a massage. Although it was 3:30am in the morning, I was able to get a massage in my room for $5.00 (from a girl). 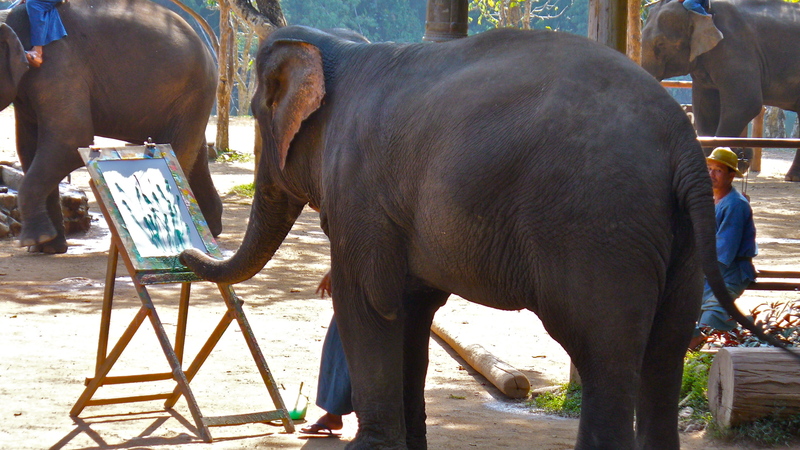 It was the first of four massages I would enjoy while in Southeast Asia. 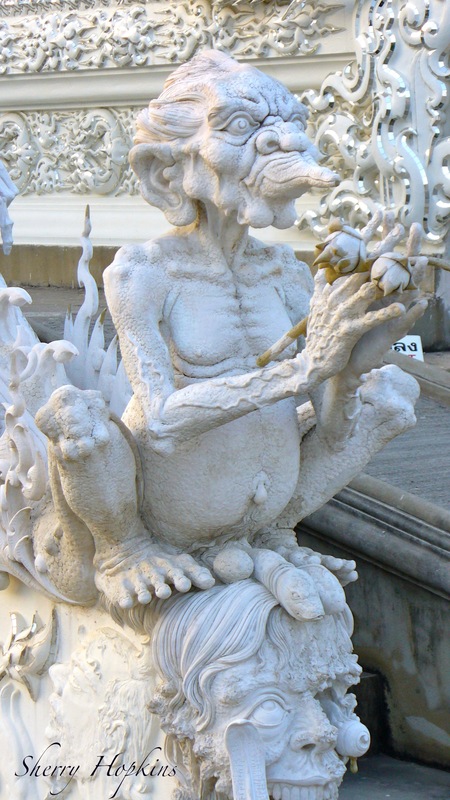 After sleeping for a few hours I briefly explored Bangkok prior to attending a “get acquainted” meeting with the other tour attendees, who turned out to be a married couple from England on their honeymoon and four women from Germany, California, England, and Canada. The following day we took a boat ride on the famous canals aka Klongs of Bangkok and visited a Buddhist Temple…one of many to come! I took some video footage from my trip and made a few movies (for the first time) with my Mac…so if you’d like to see some very aggressive catfish, watch this. 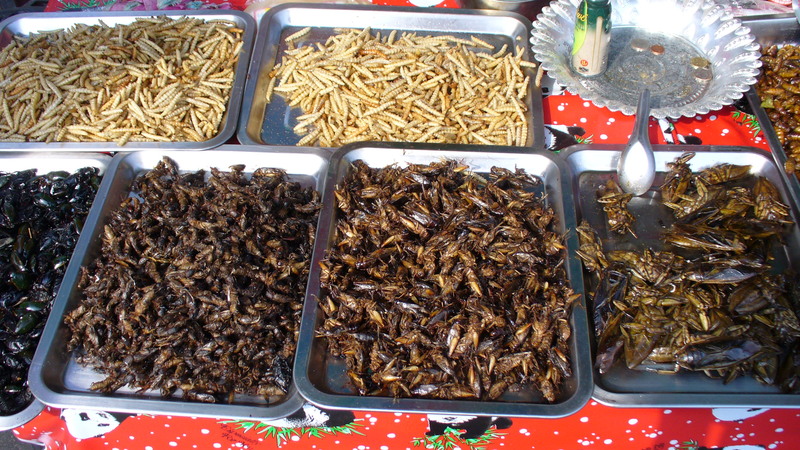 I didn’t partake of any fried bugs…but if I hosted a travel show like Andrew Zimmern…I would! 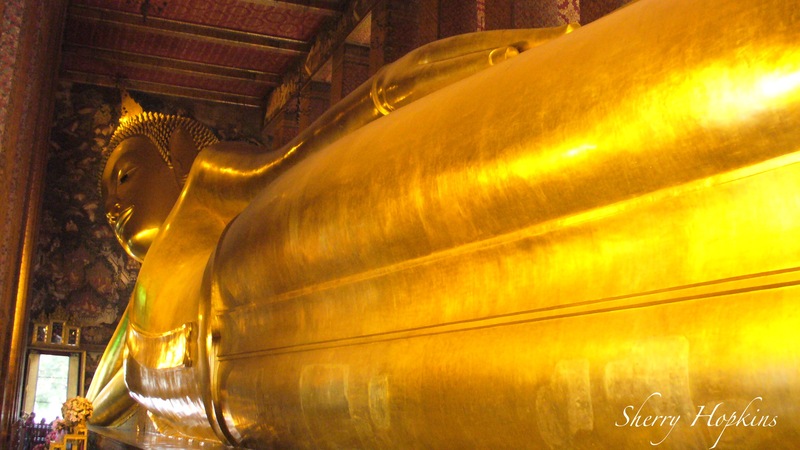 We went to the Wat Pho temple where the largest “reclining buddha” is housed! Riding in a “tuk-tuk” is a fun experience! 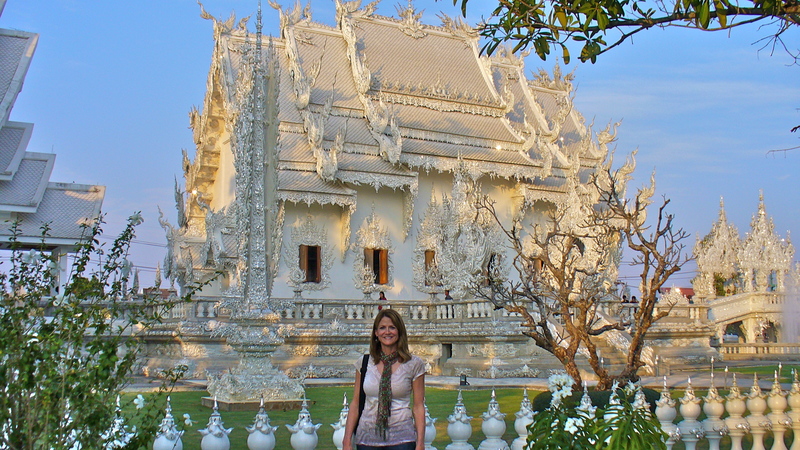 I have a treat for tomorrow…the dazzling White Temple! 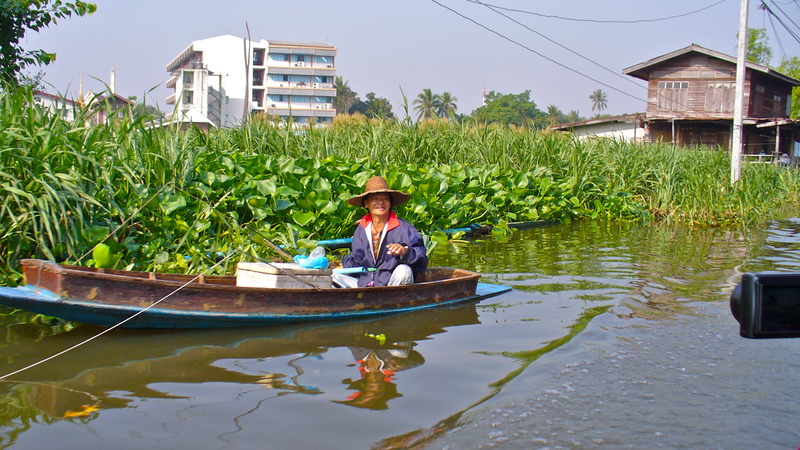 Upon arrival in Hanoi, Vietnam from Vientiane, Laos, it seemed I had entered an alien land! A city of concrete…jumbled wires…a sea of motor scooters blind to the traffic lights…mass chaos with purpose…face masks creating a barrier from the dusty city…an assault on the senses with smells and colors. Pure insanity!! The seven of us, on this tour through GAP Adventures, were instructed on how to cross the street. 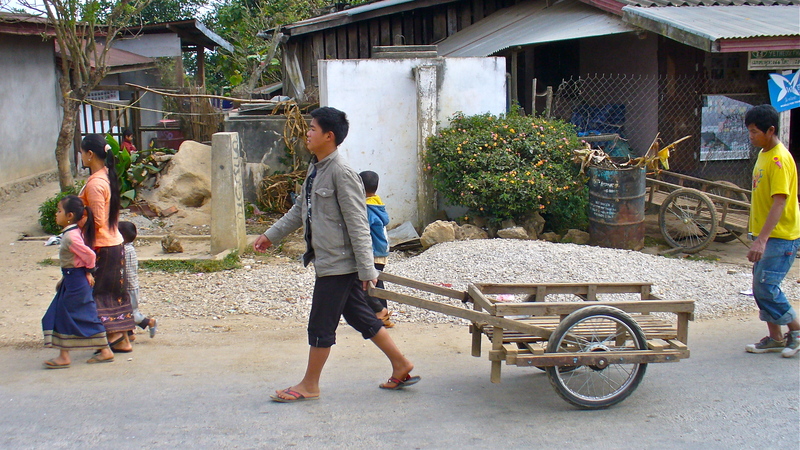 To walk–not run–to keep walking–that the drivers would go around us. I felt like a duck on a shooting range. Luckily, I have a spiritual grounding and realize that there are some things I have very little control over. After being separated from the group while shopping that evening, there was a moment of sheer panic! I didn’t know the name of our hotel. The Tour Guide had given the information to everyone–when I was in the restroom–so I didn’t receive it. But I found my way to the meetup spot…whew!! 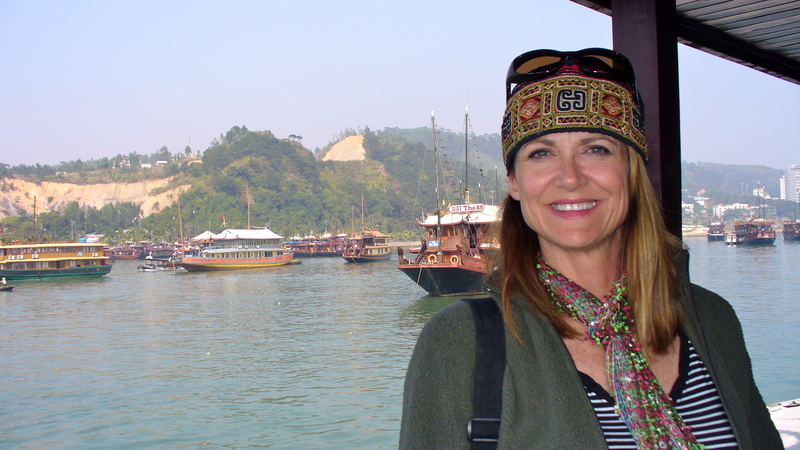 I made arrangements to spend the night on a boat on Halong Bay in the China Sea and said my “goodbyes” to the group! 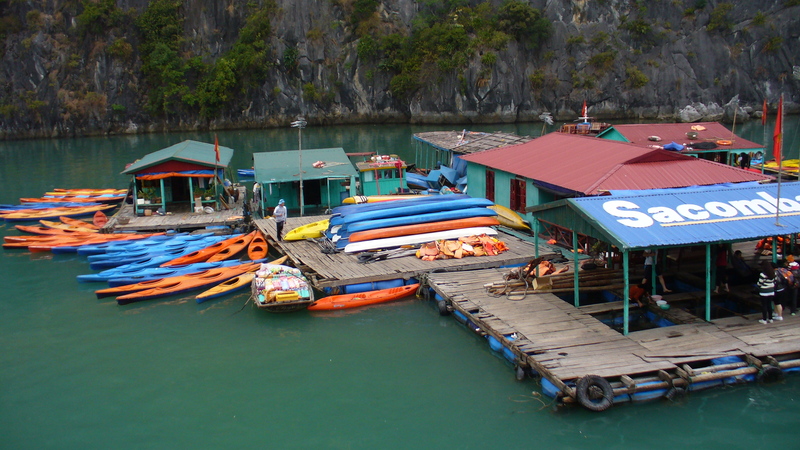 At $68 for the entire excursion–it was a small price for such serenity and beauty! 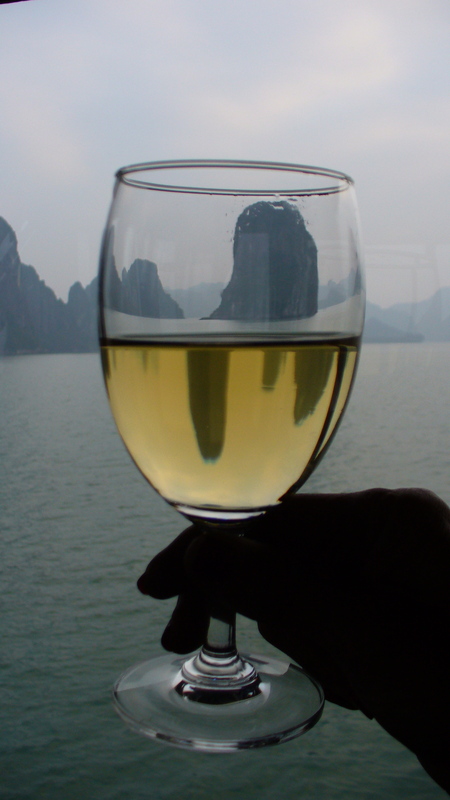 Had a nice glass of vino! Although I had a six hour layover in Nagoya, Japan‘s airport, on my way home to Cincinnati, I had plenty to keep myself occupied with there. It was a destination onto itself, with over 60 shops and restaurants and a spa! Upon arrival at the airport, I met a girl named Andrea who had been teaching English in Hanoi for four months and was so fearful of crossing the street that she decided to move back home to Canada. We went to the Spa together. The women had their own hot tub, cold dip, sauna, and steam room area with a view of planes landing and taking off. We didn’t have our bathing suits, but the other women were naked so…when in Rome. It makes for a great story…”Naked in the Airport”! 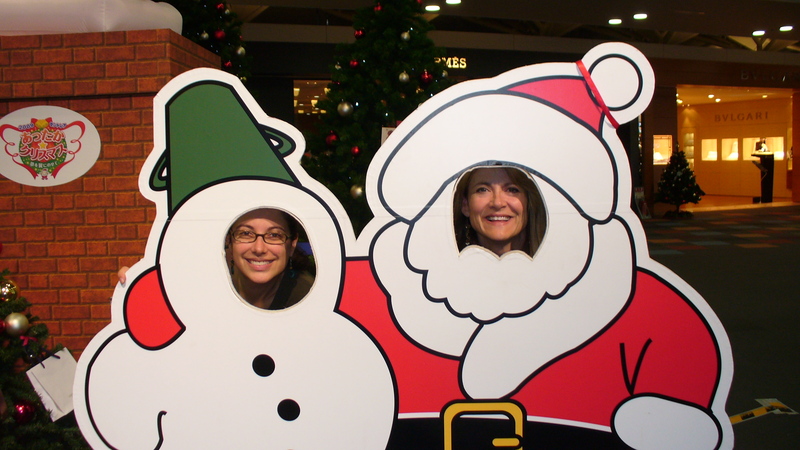 This is Andrea and I at the Airport in Japan. I returned home on Christmas Eve. I hope you had fun following my adventure! 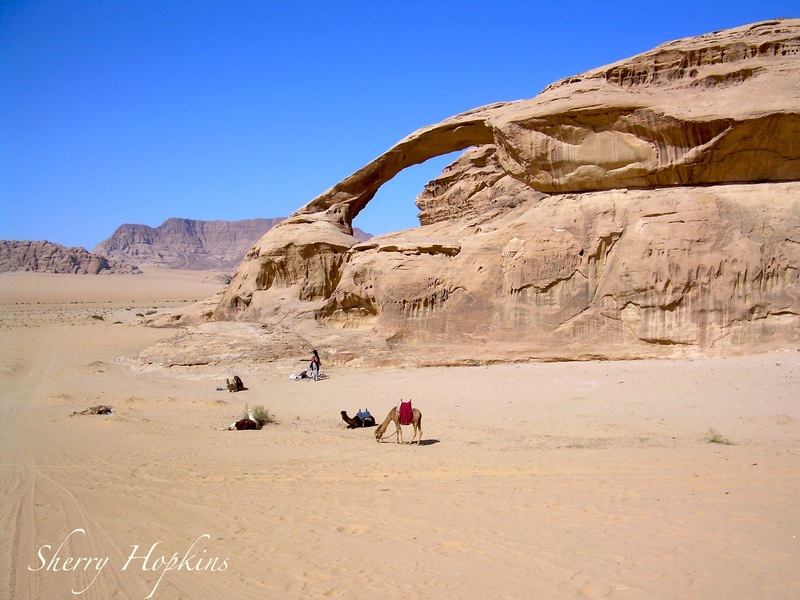 One of the highlights for me while traveling through Egypt and Jordan with GAP Adventures in 2009, was sleeping in the desert with the Bedouin people. Upon arrival to the camping area in the desert, we dropped our gear and made our way to the main dining tent for dinner. The following day we took a jeep ride through the desert and I asked if I could drive. The Bedouin driver “Mohammad” agreed to allow me and kept telling me what a good driver I was as I careened over sand dunes. I wonder if the 4 passengers sitting in the open bed of the truck felt the same way after being jostled and bounced around…possibly fearing for their lives! I love this photo I took of the “Siq”, which is the mile long walk before arriving to the area called Petra, where all of the carved buildings are. You are surrounded by towering walls of stone on either side as you walk. 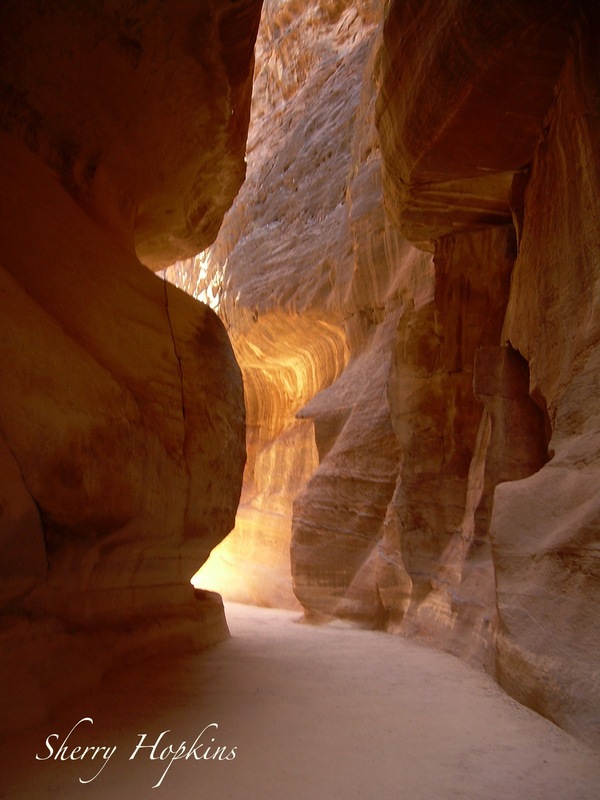 We hiked for two days throughout Petra…it was amazing! Walking to the main entrance of Petra, I met a couple of 25ish men. 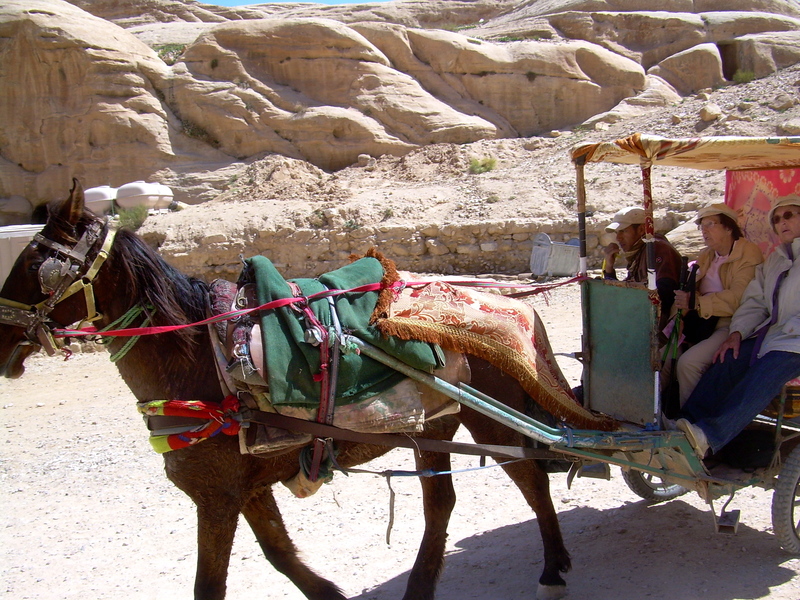 I discovered that one of them made his living taking people for rides within Petra on a donkey. After a few minutes, he began flirting with me and wanted to take me to his “cave” on a date. I told him I was married…but that didn’t faze him. Throughout the day, I would see him and he would wave. He gave me the tip of walking down a few steps for the photo shown below…so you don’t see the throngs of people! These buildings carved into stone were simply unbelievably beautiful! They were massive! 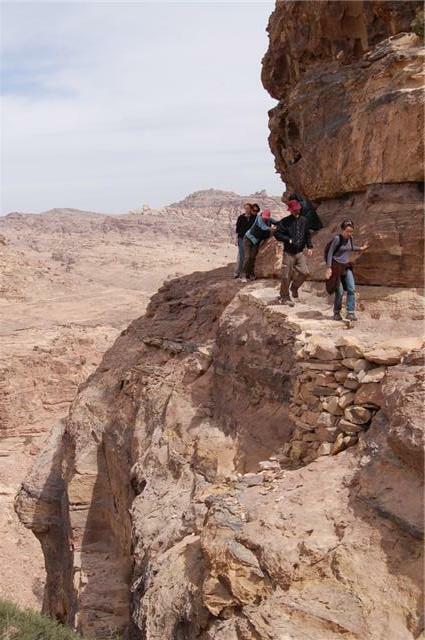 A fellow traveler took this photo of me carefully crossing a very narrow ledge while hiking in Petra…whew! 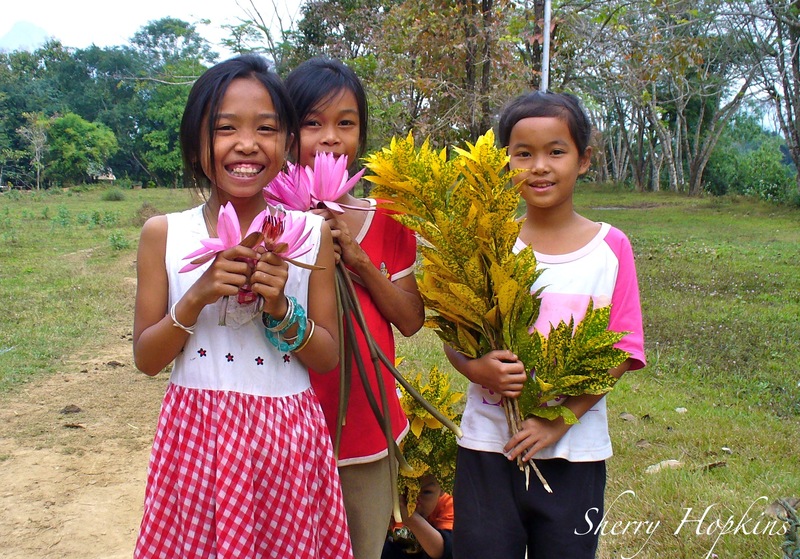 Children have such an exuberance for life…an openness…that I wish more adults could keep! Another unique experience we had was going to a Turkish bath while in Jordan. The steam room resembled a cave and we were instructed to sit in the steam for 20 minutes…to then exit and be doused with cold water by a squat, muscled man in swim trunks…repeating this process three times…then to lay on a cold marble slab while he scrubs you with a mitt (ouch…that hurt)…pours cool water on you…slathers oil all over…massages roughly for five minutes and you’re done!! 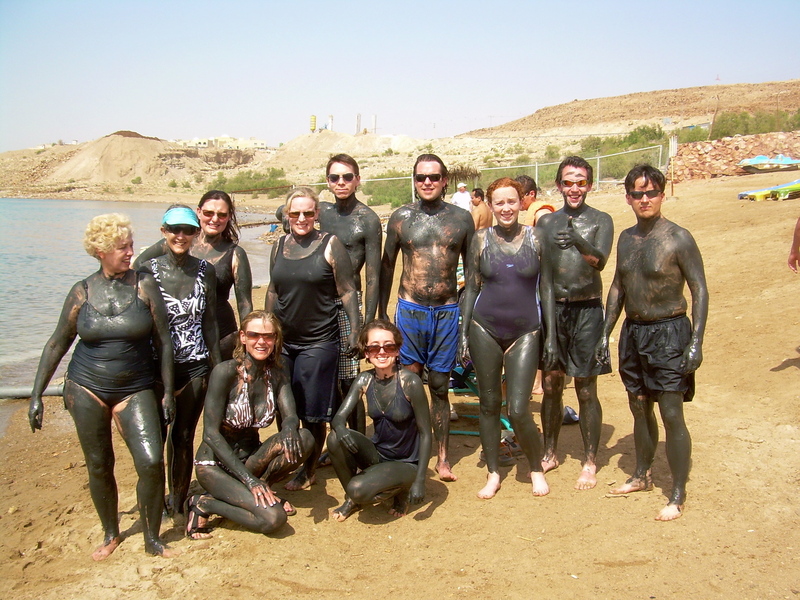 Here is a group shot of us at the “Dead Sea“…the mud from the sea detoxifies your skin and makes it baby soft! And you really do float in the Dead Sea! 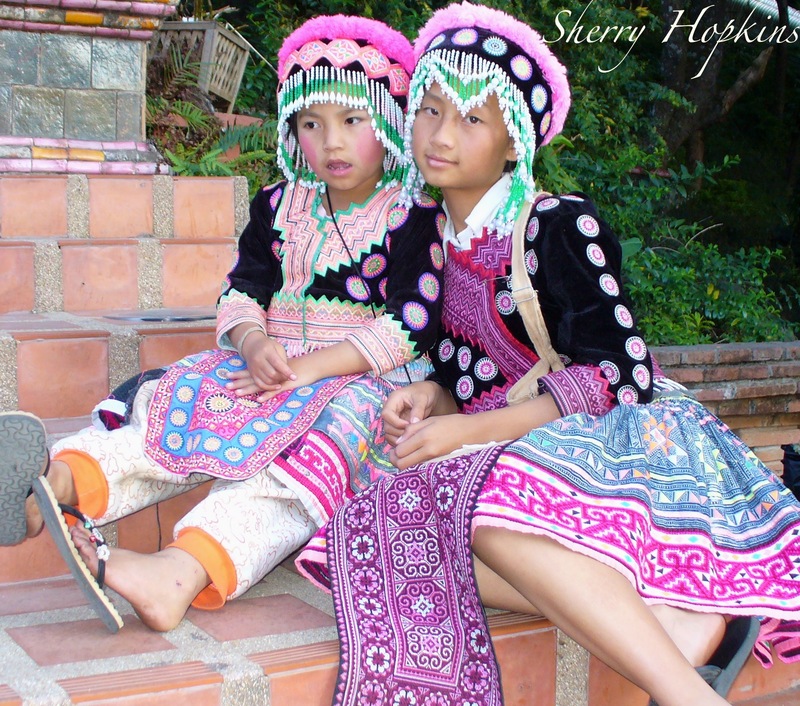 here on my blog…or visit Unesco World Heritage Sites.